Sometimes things work out too well. 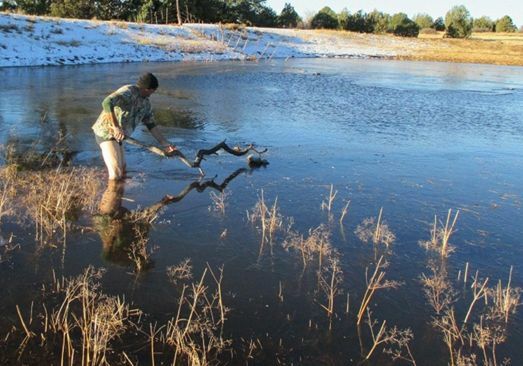 According to the weather reports for Payson the waterholes around there should not have been frozen shut. Ron and I gambled, headed north the day after Christmas in pursuit of ducks. The first waterhole we checked was mostly covered with ice and void of any feathered beast. Plus the cold wind made me thank myself for wearing many layers of clothes, including long johns. Hole #2 allowed us a view from about a half mile away. And at least 4 birds were on it! We got our guns ready, fetched a telescopic fishing rod with top-water lure, and made our approach in a wide circle to get at them from behind the berm. Then we jumped them and fired. With his pump and my over/under empty, all four ducks were down! One required a finishing shot. Only then did we realize that all four were still on the open water, and all around this waterhole was a layer of ice, about a quarter inch thick. But we came prepared, with that fishing rod, remember? Well, cast #1 went perfectly, with the lure on retrieve aiming right for the closest duck. But the lure bumped the edge of the ice and hopped over that duck. Try again – same thing happened. On cast number three I reeled slower, and the lure snagged the ice and the line broke. The wind quickly drifted that lure to deeper waters. Game over. Now what? It looked like we might get at the closest duck with a big (as in long) stick. Off we went looking for one. No, there was nothing long enough. Or rather, that duck was just a little too far from the bank. Oh, why didn’t I bring my waders!? So what if they are old and one boot leaks a little. Time for drastic measures, if we wanted the ducks. We wanted! I had brought rubber boots. They could serve as a second dry set of footwear. So then, off came the hiking boots, socks, pants and long johns. In my underwear and wearing just the hiking boots I broke the ice and with plenty of quivering and quiet cussing entered the icy mucky waters. It got deep way quicker than I wanted. The water was numbing cold. But with a branch, longest we could find, I fished out duck number one. I don’t know what was worse, the icy water or the darn wind once my wet suspension came back out. Ron had driven that day. He moved his truck close by, with engine idling and the heater at full blast. Two shop rags served as towels. I hopped back into the cab until I got at least some feeling back into my lower legs and feet. Then I attempted duck number two. OK, to make it short, I drew a line, I did NOT submerge the very sensitive body parts. That did not get me close enough to #2, and for sure not to numbers 3 and 4. In fact, I crawled back into the cab again, unthawed, and re-dressed. Tying two branches together for extended reach did not work, either. Then Ron had a crazy idea. He had found a section of barbed wire. We attached some rope on each end. The ‘rig’ was now long enough reach across the entire pond, at least 50 steps. So then, with each of us on opposite ends and pulling to get or relax tension in that rope/wire ‘tool’, we managed after many attempts to fling the second duck onto the ice, then dragged the barbed wire section across that duck to get it within our reach. It worked! We repeated that procedure for the last two ducks. By then it was 10 AM. We had shot them in 2 seconds. Retrieval took over 2 hours. And we swore to ourselves that we’d learned a lesson, from now on to let them fly past the water’s edge before pulling the trigger. There were 4 additional waterholes we visited that day. Things did not go perfect when we did encounter more ducks. But we managed to bag three mallards as well, and none were lost or required severe measures of retrieval. We even returned to that fateful hole later in the day. No ducks died. However, I was able to retrieve my lure, since the wind had moved it closer to the opposite bank. Encouraged by those seven ducks and the lessons learned we planned our next trip the coming Monday. That day we really were prepared! Along came my waders, a 12-foot telescopic fishing rod, extra lures and hooks, a home-made lure that would not snag on the ice, and sections of aluminum tubing which could function as 15 foot extensions to attach to the fishing rod. It had frozen more, but there was little wind. The very first hole we visited had been completely open four days prior. Now there was only a little section in its middle free of ice, but with several Scaup on it. Distance from the berm to the open water was substantial. We only winged one bird. It dove under the ice upon my follow-up shot, never to be seen again. We used rocks to bust the ice near where the bird had disappeared. It did not float back up. To make it short, we checked quite a few water holes. Most were completely frozen over. By noon we had only seen ducks on a new (to us) hole. A wrong approach spooked the five mallards before we were in range. So off to the next pond for a new try, that was our routine. When we topped the berm of the last hole for that day, things changed. One mallard drake sat on the edge of the ice, within fine shotgun distance. Unfortunately Ron and I both fired at that one, dropping it like a rock. Next we emptied our guns on the next drake, dropping him also. That’s when some twenty birds lifted off. All escaped unmolested by steel pellets! We could not reload in time. Except one duck came over seconds later, apparently for another look at all the disturbance. Ron nailed that one, dropping it nicely on land. Here we go again, two ducks dead on the pond. Out came the big fishing rod. The homemade lure did indeed clear the edge of the ice just fine. But with equal efficiency it failed to hook any duck. Eventually the line broke anyway, and the useless ‘lure’ got lost. So I put on my waders, and added the extensions to the fishing rod. Wading up to chest deep and reaching with some 30 feet of contraption, I could reach the closest duck. But it did not move onto the ice. So we threw rocks and broke the ice in front of it. That dislodged the critter, except the wind blew it out of reach. It was like starting over. Now the only option was the fishing rod with topwater lure. Whenever that lure got stuck on the edge of the ice, Ron threw rocks and freed it. Over an hour after killing the ducks did we finally hook the first one, and slowly dragged it closer. At least the sun had thinned the ice, and larger rocks (always a good supply of those around anywhere in Arizona) would bust up a decent path. By the time we got the last duck off that pond, a good two hours had again been burnt. It was basically time to head home. As Ron put it: 28 man-hours, a tank of gas, and a three-duck yield. Good thing we still have our day jobs. But great memories will stay with us, and hopefully experience gained to hunt more efficiently next time. “Time” is the critical factor! 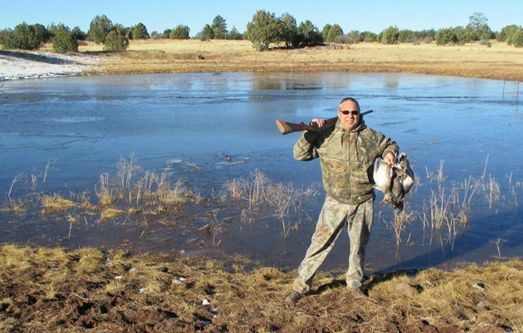 Ducks are there, in the Arizona higher country. But one needs to monitor the weather, and hunt them before too much ice forms. Unless you have a dry suit.